Planning a party, baby or wedding shower? Getting married? Then you are going to need invitations! And you want something unique and fun to get your guests as excited about your party or wedding as you are. Be the first in your crowd to send elegant, custom couture MUSICAL invitations and everyone will think they are coming to a celebrity event. Musical Invitations are the HOTTEST Celebrity trend right now and until 6/30/2013 Music Box Invites – the only CUSTOM musical invitation company (patent-pending) – is offering a 20% discount on all orders booked by 6/30/2013. Art fee and contract must be turned in by 6/30 in order to get the 20% off Musical Invitations discount. Semi-custom invites begin at $15 per set (set includes embellished invite, box, RSVP, RSVP envelope and music) and take about 8-12 weeks to produce. 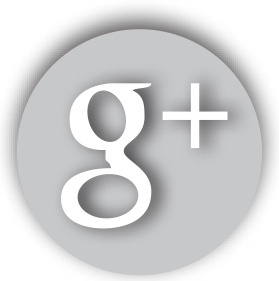 Check out our timeline function to see when you should schedule a consultation for your invitations. Use the code BLING when you inquire or set up your consultation now by calling Nancy at 321-277-2415 or fill out this form and we will get right back to you! 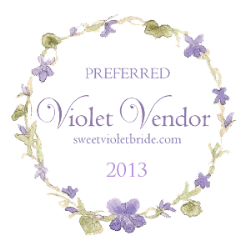 Music Box Invites Survey finds that Central Florida brides LOVE purple! The “other” colors getting two or less votes included silver, gold, brown, white, and yellow. Blue seemed to always be paired with another color (e.g., Blue and Coral or Navy and Yellow). Aqua was teamed a lot with Coral – but of course that could be because of all the beach weddings in Florida. Music Box Invites offers a line of Custom Couture wedding invitations where each bride can work with the Music Box team to create a totally customized invitation package incorporating music or other sound bites. They also offer a semi-custom line beginning at only $15 per set where a bride can choose from one of 10 designs in various colors and papers. Offering personalized music or sound, sumptuous papers, custom jeweled products featuring exquisite details; the end result is always a one-of-a-kind creation that is truly a work of art. In addition to the patent-pending musical wedding invitations, the team can also create invitations with music for baby showers, bar and bat mitzvahs, Quinceañera celebrations, and other special events. For more information, contact Joann (joann@musicboxinvites.com) or visit www.musicboxinvites.com. At Music Box Invites, we use REAL artists to make completely customized invitation designs for our brides. We know that brides have a vision and you can’t always get that with a existing graphic design so we reached out to our local artist community and have them at the ready to help brides achieve that personalized invitation that is just for them! One of these artists is Maria Soto who designed our elegant yet colorful kissing Peacocks which were the hit of the recent bridal show. Maria told us that from her earliest memories she always had crayon, pencil or pen in her hand. Maria realized she had a knack for drawing and began to develop her talent more through middle and high school. Each year she competes in the Nationwide Fine Arts Festival and two years ago she entered in the Visual Art 2D category and made it to the top 14 – out of more than 65,000 entries – in the Nation. 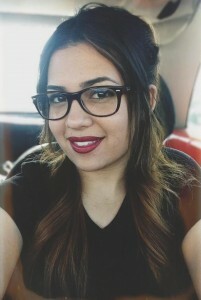 Maria is now on her way to attaining a Bachelor’s of Fine Art degree and her dreams and goals for the art community get bigger every single day. She appreciates the opportunity to promote her art through Music Box Invites and hopes that she can make many brides happy! Be Like Kim Kardashian – get musical invitations for your event! Kim Kardashian’s sisters Kourtney and Khloe are throwing a baby shower for Kim and her daddy-to-be rapper boyfriend Kanye West. According to E! 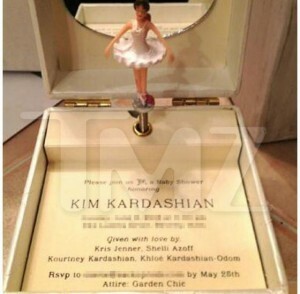 Online, the invitations were contained in a ballerina music box that when opened played Kanye’s famous song, “Hey Mama” and put into motion a twirling toy ballerina. While Music Box Invites doesn’t have the dancing Ballerina (yet! 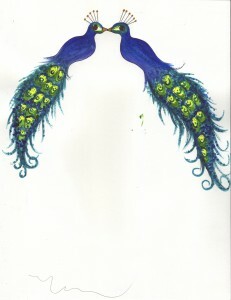 ), they are the only patent-pending custom, couture MUSICAL invitation company. 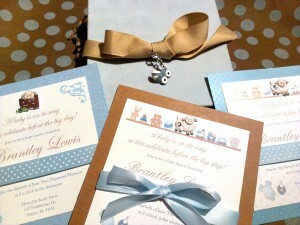 Their adorable baby shower invitations play “Lullaby and Good Night” when opened by the invited guests. “One of our special features” says Joann Marks, founder of the company, “is to include a charm on each invite that the guests can then bring to the shower and give to the mother-to-be to add to her Pandora-style charm bracelet.” These are some of the special touches that her company includes so that the invitation sets the tone of the event. 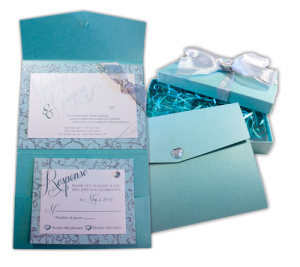 In addition to baby shower invitations, Music Box Invites offers a line of “Custom Couture” wedding invitations where each bride can work with the Music Box team to create a totally customized invitation package incorporating music or other sound bites. 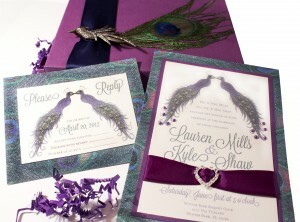 They also offer a semi-custom line where a bride can choose from one of 10 designs in various colors and papers. Offering personalized music or sound, sumptuous papers, custom jeweled products featuring fine details and superior workmanship, the end result is always a one-of-a-kind creation that is truly a work of art. And that is not all – they can make any event a celebrity style event – the team can also create invitations with music for birthdays, bar and bat mitzvahs, Quinceañera celebrations, and other special events. But unlike the price a celebrity like Kim Kardashian pays,Music Box Invites have semi-custom invitations that start at only $15 per set and that includes the invitation, RSVP card/envelope, box, music and embellishments! Co-founder, Joann Marks, was surprised she was unable to find musical invitations for her wedding so she set about to create them herself. Beginning with a custom invitation she added more details and configured a beautiful box that sang “Fly Me to the Moon” (her wedding dance music) when opened. Her guests talked about the invitations so much that she decided to start a company with her designer friend, Nancy Faulk. They feel there is room in the wedding invitations industry for musical invitations since many of the greeting cards purchased today are musical. Music Box InvitesTM offers a line of “Couture Custom” wedding invitations where each bride can work with the Music Box team to create a completely custom invitation package incorporating music or other sound bites. 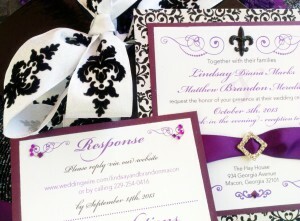 They also offer a semi-custom line where a bride can choose from one of ten designs in various colors and papers. Music Box Invites doesn’t stop at just wedding invitations. Musical invitations are available for birthday parties, baby showers, Bar/Bat Mitzvahs, Quinceañeras and other events. Plus, they can do wedding menu’s, fans, program cards and even Save the Date cards. Contact Music Box Invites today for more info.